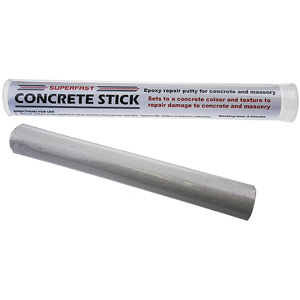 Superfast Steel-Stick contains steel for hard, fast-setting repairs. This industrial-strength polymer compound will give permanent repairs to anything made of steel or other metals. It also bonds to wood, glass, masonry, and many plastics. Each handy stick contains pre-measured portions of activator and base throughout – no measuring or mixing tools are necessary. As the epoxy is mixed, the two contrasting colours blend into one colour to indicate complete mixing. The consistency eliminates drips and runs, facilitates adhesion to the substrate, and allows the material to be shaped and formed as needed before curing begins. 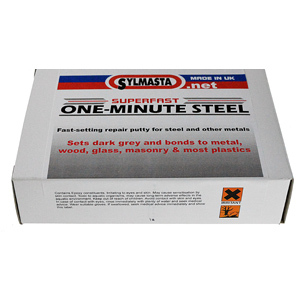 Superfast Steel-Stick cures to a dark grey metallic colour. 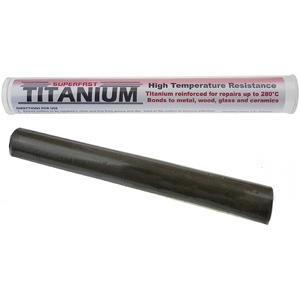 Once cured, it can be tapped, drilled, screwed, sawed, machined, ground, filed, or painted, and does not rust.